Survive the onslaught until the messenger returns, and the citadel will be saved! So much potential. So many lovely miniatures. CMON continue to impress with the amount of stuff you get for backing their Kickstarter campaigns, and this is particularly tasty. But the game? Well, I’m not sure. It’s an exciting, beautifully designed package that has a lot going for it, but it is also extremely dependent on the whims of chance – and that’s a problem when you have a co-operative ‘us versus the game’ premise. Because no matter how well you play, no matter how experienced you are, it could all come down to a few bad dice rolls after you’ve been playing for hours. Which is just annoying. A bit of randomness is always fine, but this game absolutely revels in randomness at every opportunity. 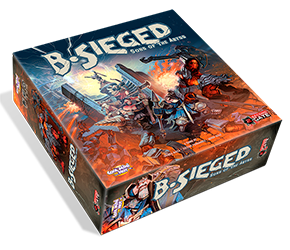 I do want to play B.Sieged more and see if it improves, but I can’t help thinking it would have been better as a competitive game rather than a coop one. And the less said the better about its gawdawful name! Is this based on the original rules or the updated 1.1 rulebook? Thank you. It’s been a while, but I’m pretty sure it’s the updated one. Let me know if you find anything wrong.